At the Jasper County Airport Authority’s (JCAA) June meeting, the JCAA paused to celebrate and recognize four, local aviators for their respective accomplishments and service. First, having logged his first flight in June of 1946, Mr. Charles Comer was presented with a certificate recognizing his seventy years of flight, and similarly, having logged his first flight in June of 1966, Mr. Richard Comingore was presented with a certificate recognizing his fifty years of flight. Thereafter, Mr. John Sjaardema and Mr. Craig Jackson were awarded the Jasper County Airport Windsock Award for their respective service to Jasper County Airport. Just as the windsock presented to Mr. Sjaardema offered guidance to aviators at Jasper County Airport during its 2013/2014 tenure, Mr. Sjaardema similarly provided direction to a brighter future for Jasper County Airport through his dual service as Airport Manager (2000-2013) and President/Owner of Excel-Air Services, Inc. at Jasper County Airport (2000-Present). Likewise, just as the windsock presented to Mr. Jackson offered guidance to aviators at Jasper County Airport during its 2014/2015 tenure, Mr. Jackson similarly provided direction to a brighter future for Jasper County Airport through his dedicated service as JCAA Secretary/Treasurer (2010-Present). 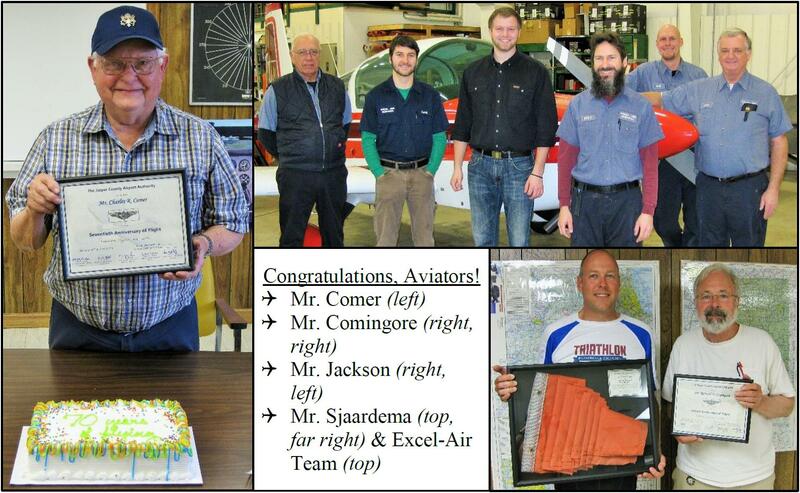 From all of us at Jasper County Airport, congratulations, Mr. Comer and Mr. Comingore, and thank you, Mr. Sjaardema and Mr. Jackson!